On most trips out we set out a couple of crab traps in search of a few excellent appetizers prior to that salmon you are going to be barbequeing. 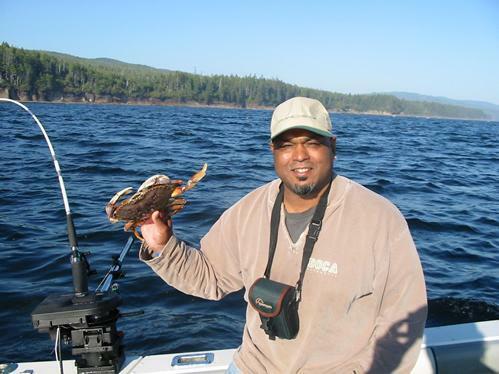 In our area the species we catch are Dungeness and Red Rock. There is no additional charge for setting out the bait and crab traps. It does cut a few minutes into getting to and from the fishing grounds and many people are purely interested in fishing. Therefore, our complimentary crab service is available on request. It’s well worth it if you get a few so do remember to ask about it when you are booking your D&D Fishing Adventure. Setting crab traps does depend on the tidal flow on the day you’re going out. The tidal flows should be slow moving to trap crab.